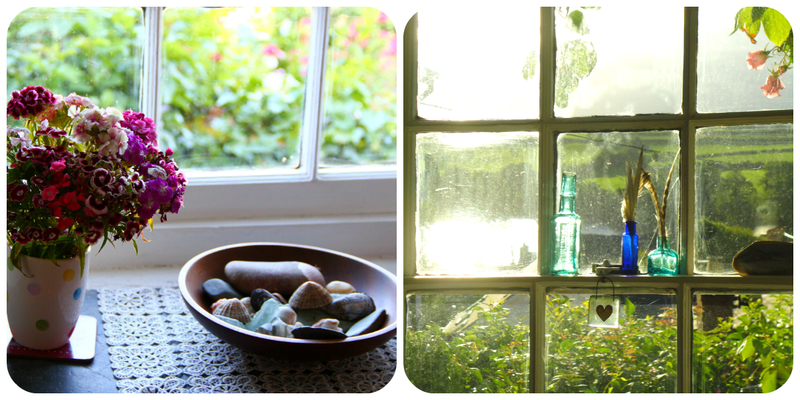 Nothing compares to waking up on the first day of your holiday, with a whole two weeks still in front of you! With the sun trying to creep in around the edges of our curtains, they were promptly opened, the sun's reflection in the mirrored surface of the estuary almost blinding us in the process. We tend to take things slowly on our first day, to recuperate from the long journey of the day before. 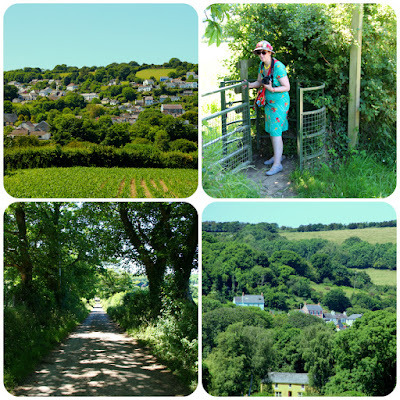 This time, a visit to nearby Cardigan was on the cards. Its Welsh name, Aberteifi, refers to its position by the mouth (aber) of the River Teifi, and in fact it lies on the opposite site of the estuary, which is visible from our cottage windows, at the point where Pembrokeshire meets Ceredigion. 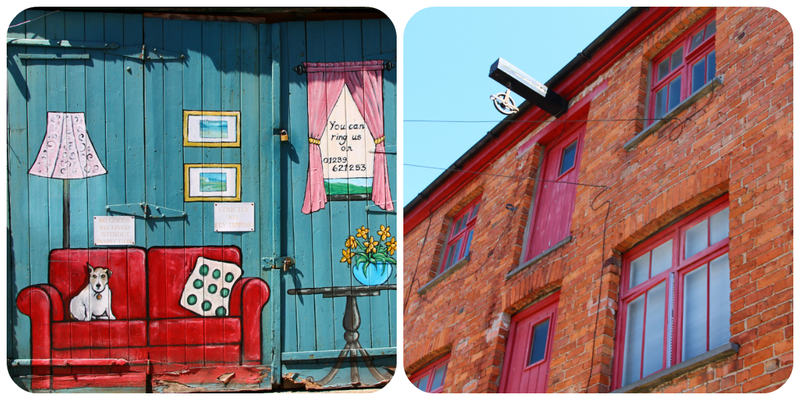 Between 2006 and 2008, the previously considered rather scruffy town (the lowest of the lowest as it was succinctly put by one of the wardens of a property we visited) underwent a face-lift, restoring many of the town centre's shop facades as well as the quayside. 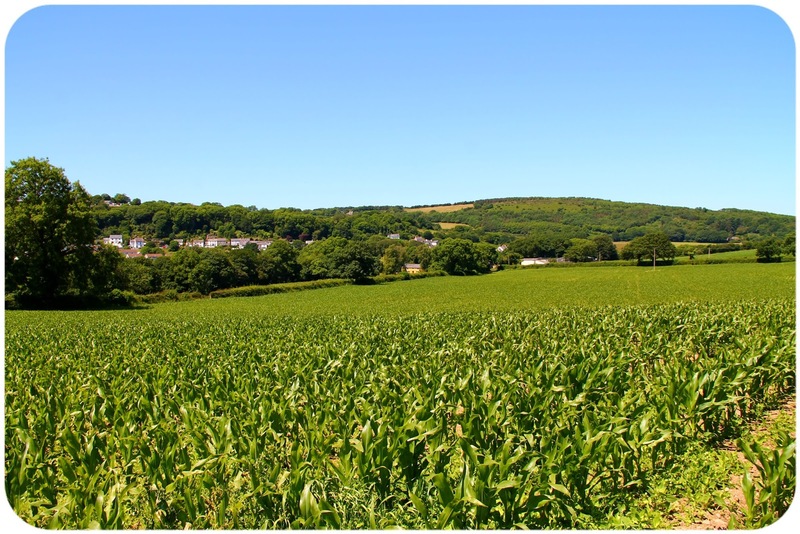 As a result, in a survey earlier this year, Cardigan was named one of the best places to live in Wales ! It is now a busy market town, with a good mix of independent and high street shops, and I counted at least seven charity shops! 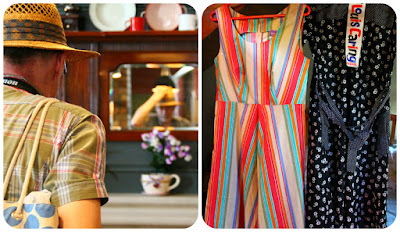 As it was a Sunday, quite a lot of the shops were closed, but we were delighted to find that one charity shop, Barnardo's, was open for business, and soon our first purchases were made: within minutes, Mr. S. had found a good quality straw hat and I left the shop with a handmade striped cotton summer dress. There was also a small car boot being held in the parking lot of a house clearance company. Inside their premises, a whole corner was dedicated to deadstock 1970s/1980s clothing, which they'd bought up from a boutique, where I found a black and white print cotton dress, complete with its original "Louis Caring" label. By now, we were getting hungry and were looking for a quiet spot to eat our picnic. 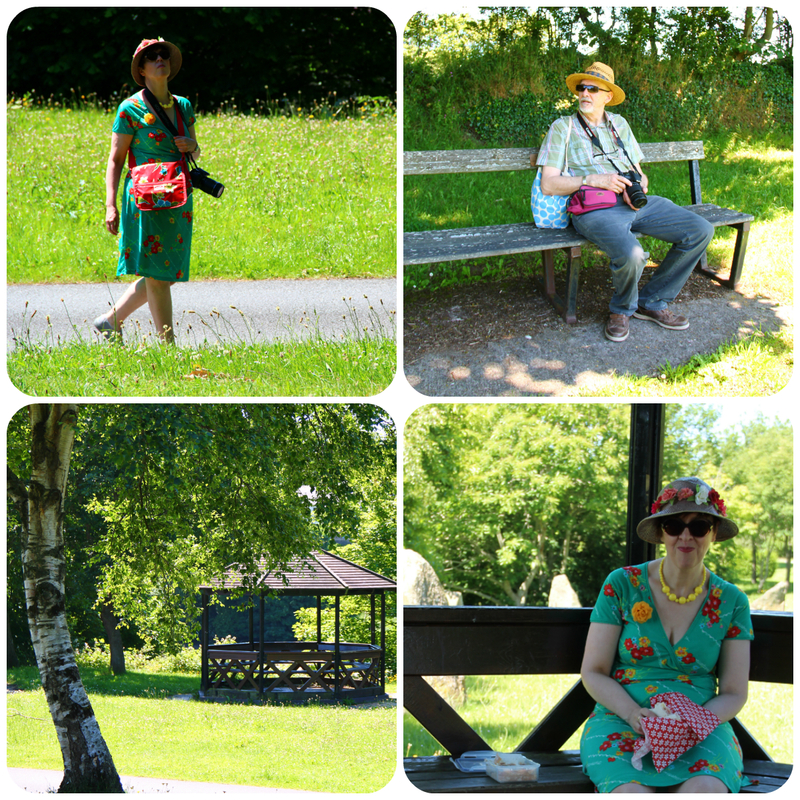 I remembered a small park just minutes from the high street, with a gazebo (where we sheltered from the rain last year) as well as a couple of benches. As luck would have it, we had the place to ourselves. The park is just minutes from the start of the Ceredigion Coast Path, along the estuary, so we walked it as far as a field we remembered from a previous visit, from which our cottage can be spotted in the far distance, on the opposite side of the estuary, which runs at the bottom of the field, hidden by trees. The cottage is part of the small cluster of houses approximately in the middle of the photo, above the yellow house. 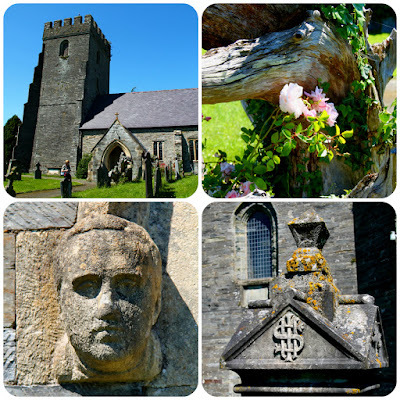 We finished our day with our first of many cups of Cappuccino, but not before visiting the parish church of St. Mary's, which we'd never been to before, but which we'd been catching glimpses of whenever we drove in or out of town on the bypass. 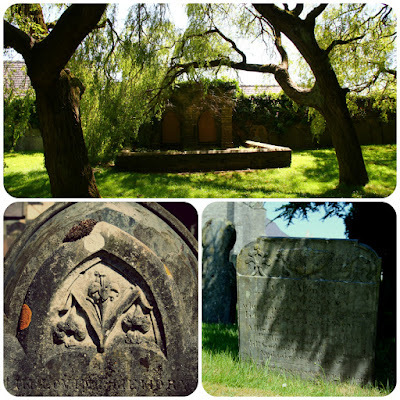 The church was closed, but we wandered around the atmospheric old churchyard, with its higgledy-piggledy gravestones, the oldest of which were lined up against the wall. The next day, Monday, was a real scorcher, so we thought we'd go down to the seaside. Llangrannog, 13 miles from Cardigan, is a small coastal village in Ceredigion, lying in a narrow valley, to which the road descends steeply, and with quite a few hairpin bends, through woods with a lingering smell of wild garlic. 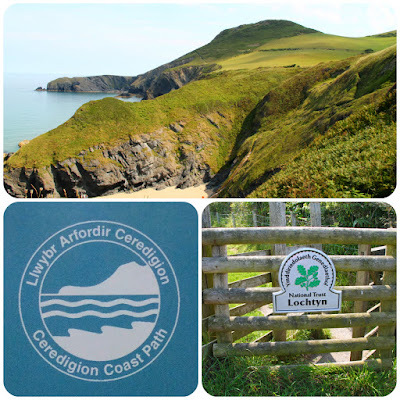 At the end, you are rewarded by not one, but two beaches, the one of Llangrannog itself and to the north, Cilborth beach, which is either accessed by steps down the cliff or from Llangrannog beach when the tide is low. But we were not there for the beaches, however enticing. 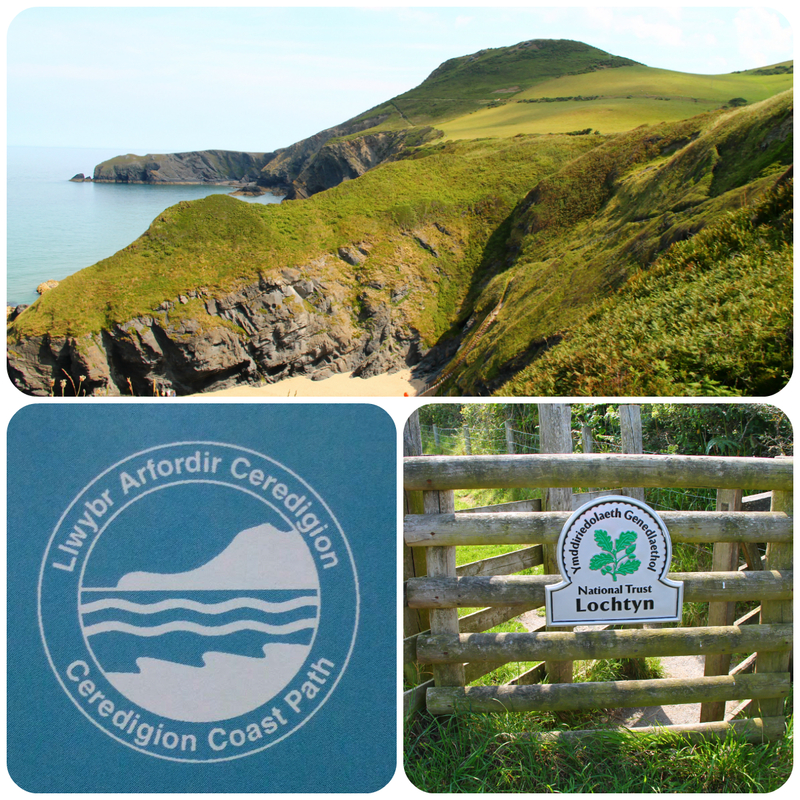 No, foolhardy that we are, we decided to take a walk along the coast path, to Ynys Lochtyn, a peninsula and small island just north of Llangrannog, said to be Ceredigion’s most scenic section of coastal path. 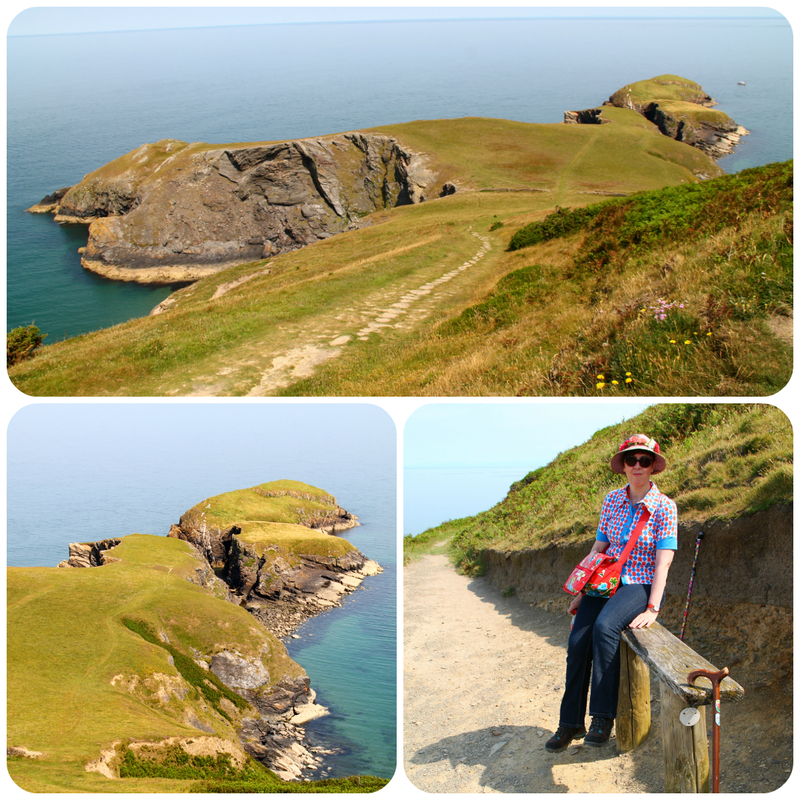 From the footpath there were wonderful views down to Llangrannog and beyond. After some more climbing the ancient hill fort of Pen y Badell and the outline of Ynys Lochtyn appeared in front of us, the silhouette of which has been used as the icon for the Ceredigion Coast Path. 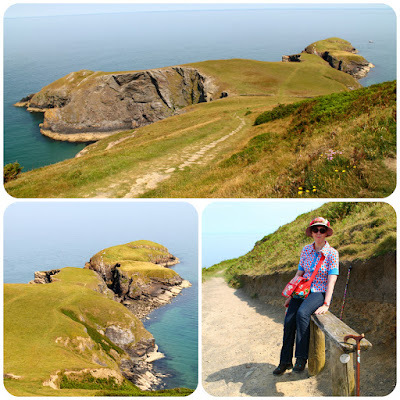 We admired the views over Ynys Lochtyn and found a shady place for a picnic, taking out our binoculars to watch the vertiginous antics of a couple of adventure seekers below the cliffs of the island, which can be reached from the peninsula at low tide. Just the thought is turning my legs into jelly, so not for me, thank you! Instead of finishing our circular walk by trudging through some fields, away from the coast, eventually ending up on the road into the village, we decided to retrace our steps along the coast path, but not before walking down to the peninsula itself. While Jos was sat looking out over the bay, the water of which looked as tranquil as a lake's, I walked around, taking in the magnificent seascape surrounding us. 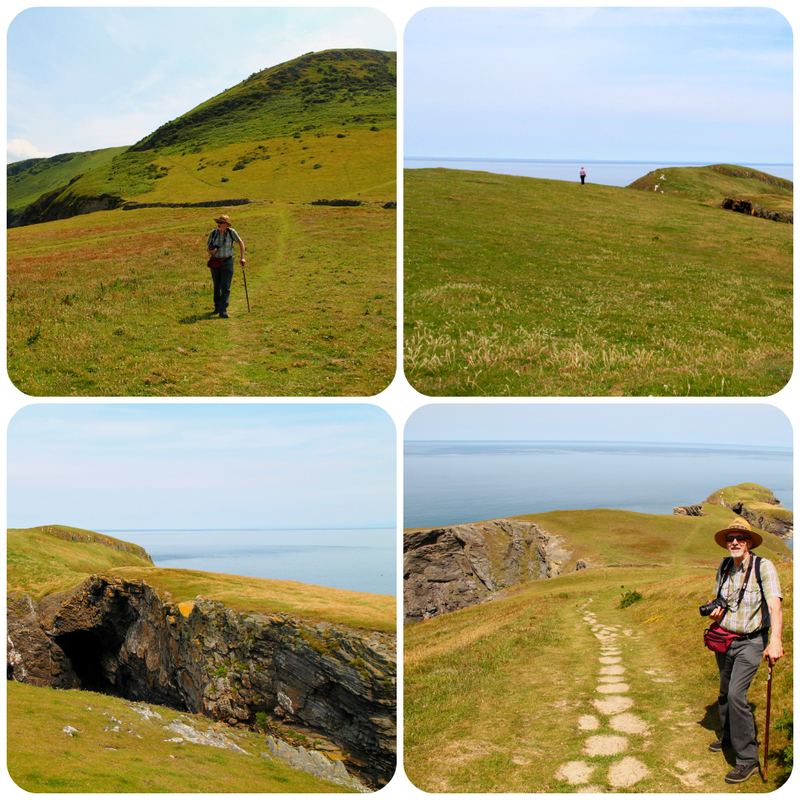 It was only when we wanted to rejoin the coast path (it's the ridge just below the darker green section of Pen y Badell) that we realized what I climb we had ahead of us, and we had to take several breathers toiling up the steep path. But instead of finding a cool breeze, the coast path, which runs partly enclosed between hedges, was a heat trap, and we arrived back in Llangrannog badly in need of refreshments. Before heading home to our cool cottage, we stopped off in Cardigan for some food shopping, visiting a charity shop or two along the way, and finding the first three of my brooches in a shop supporting Welsh charity Tŷ Hafan. How beautiful are your pictures? It looks like you have had a fabulous holiday. That must have been quite a walk. Your photos are beautiful. Lucky finds of those two dresses. Your photos are beautiful, it looks like you were in a very picturesque area. 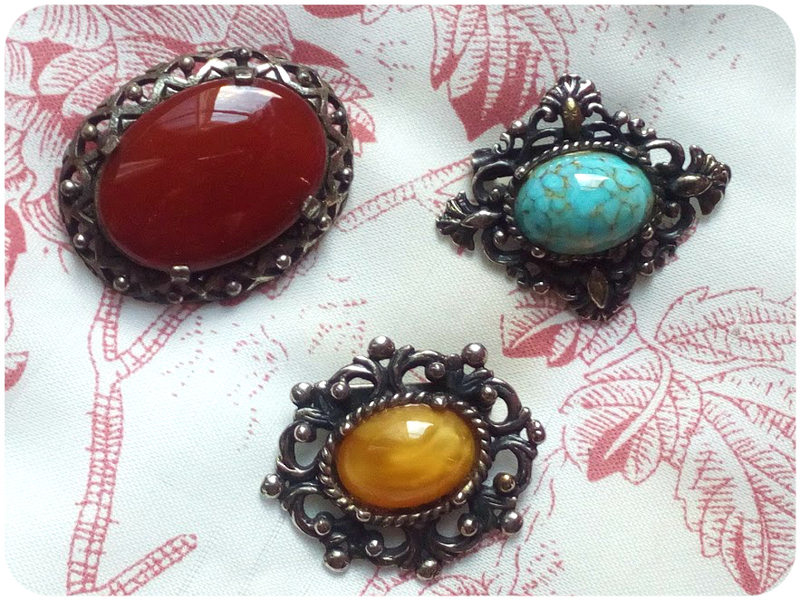 The three brooches in the last photo are all lovely. cardigan looks great and the church and yard very pittoresk! love your hats! Now that weather looks better. Glad you made the most of it. Oh my! This brings back memories of childhood holidays! 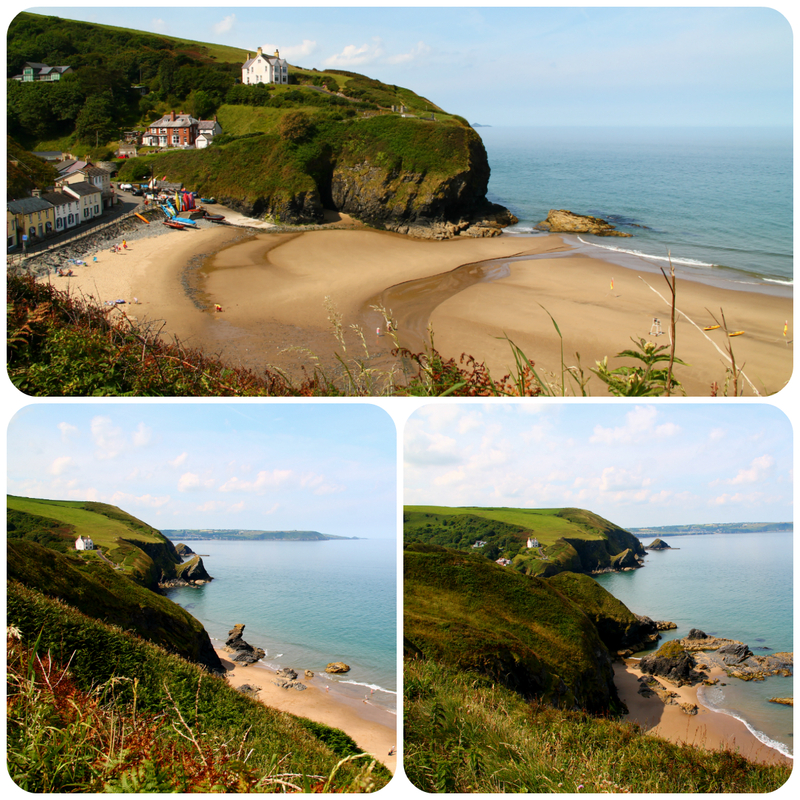 We always used to visit Llangrannog when we stayed at somewhere in or near Cardigan! It is so pretty round there- I should visit again- it's been almost 30 years!! Ann, you look fabulous in your pretty Summer outfit with flowers on your hat! And oh my, aren't you adventurous? 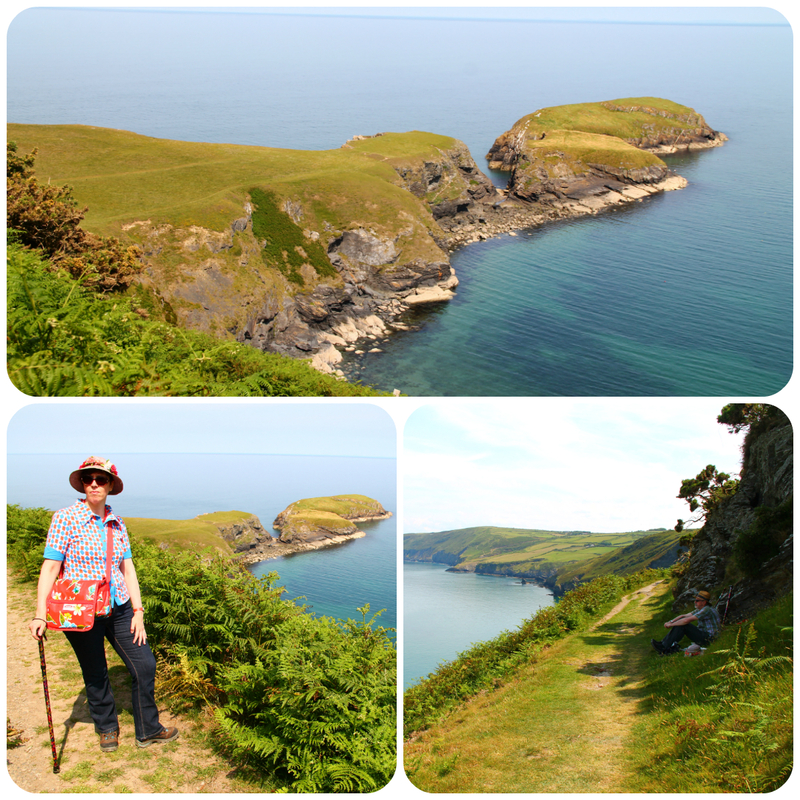 Gorgeous walk, but so challenging! 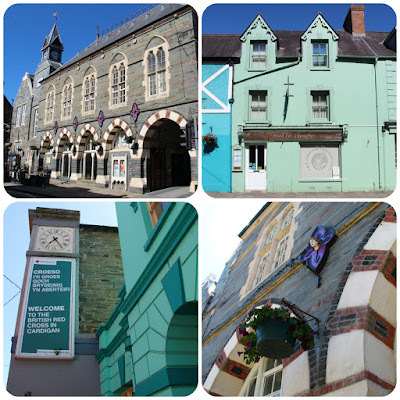 I am happy that Cardigan became such a lovely place to live again, it always is a joy to hear it about towns. 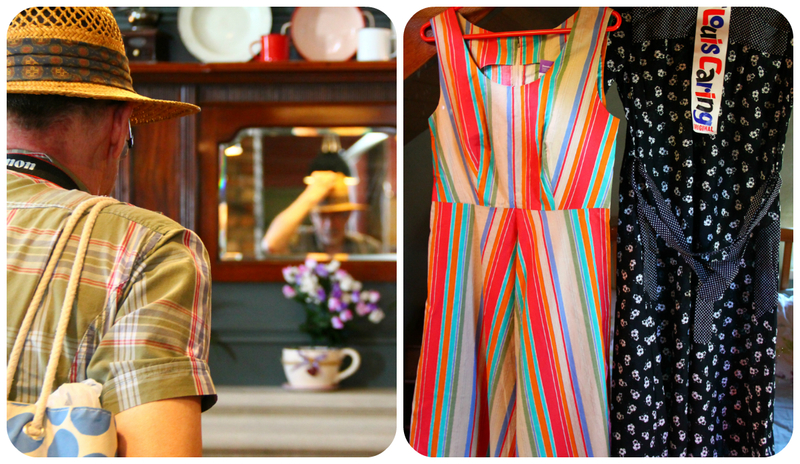 Love your new stripy dress, can't wait to see it on you! That looks utterly lovely. And it's good to see Cardigan successfully regenerating. What stunning photos! That beach in the sunshine is a joy to behold! Cardigan was a regular haunt when I was a child, it looks as beautiful today as it did in the late 1960s/early 1970s. And love all those beautiful facades and parks! 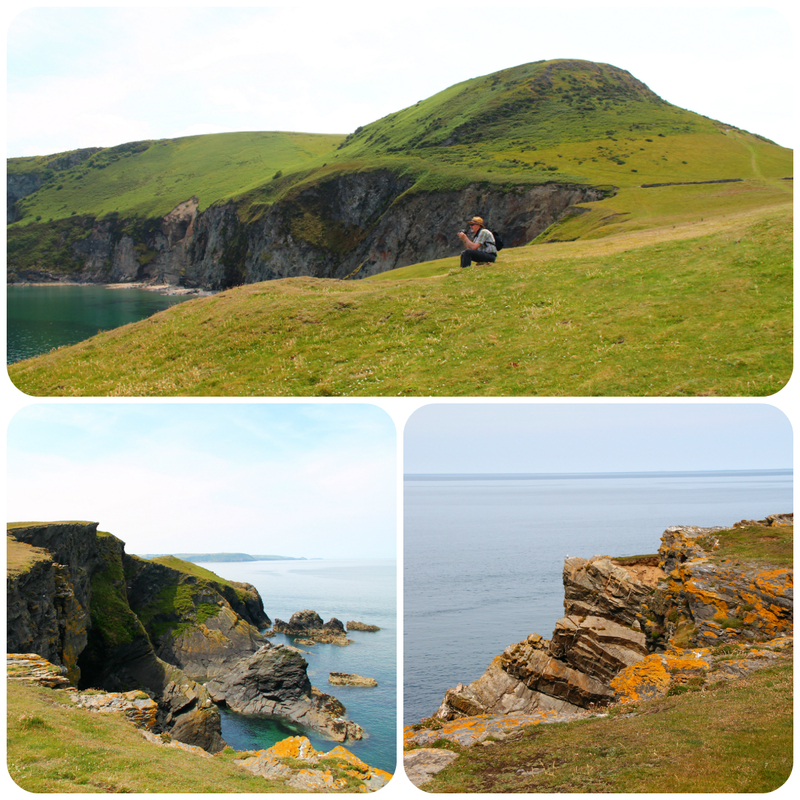 Wales is so picturesque...especially in the sunshine. Wales is looking beautiful! I love the brooches.Trying to keep up with blogs internet permitting! Love the vintage treasures you manage to find wherever you are.